According to an article in the Associated Press, Binion’s announced they will be closing their 365-room hotel, but the casino, including the poker room will remain open. Described as a cost-cutting measure, a Binion’s spokesperson stated that 100 of the 800 employees will be laid-off. 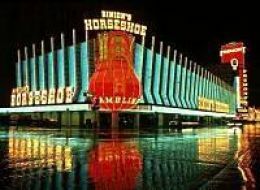 While the genesis of poker in America can be traced to New Orleans and riverboats along the Mississippi, but it was Benny Binion who was able to market the game to the masses, and Binion’s hotel and casino will always have a place in the history of poker. As the original home of the World Series of Poker since Benny Binion came up with the idea to host the poker game in his casino as a way to draw in tourists, Binion’s has had a long and very good record with poker players, and after selling the WSOP to Harrah’s a few years ago, the move to close the hotel is another sign of the changing Las Vegas landscape: Out with the old and in with the new. Remember they are still loads of online casino sites to play at. This entry was posted on Monday, November 30th, 2009 at 7:35 pm and is filed under Poker Industry News. You can follow any responses to this entry through the RSS 2.0 feed. You can leave a response, or trackback from your own site.